Jade's Journey: What is Teespring? I have been asked to review this website called Teespring. 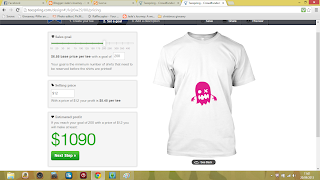 Teespring is an online company that lets you design a T-shirt and sell it online. There are a few places that offer a similar service but with Teespring you don't have to pay anything up front and you don't need to order 100 T-shirts in different sizes ready to sell on your page. You design your T-shirt on their website, which is really easy I had a play about and made some pretty cool looking Tee's. 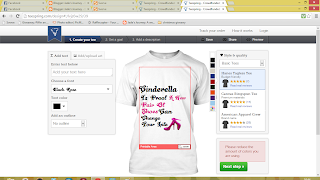 You can add text and pictures to you T-shirt, they have a selection of images that you can use or you can upload your own image. I really like that you can make it so personal. 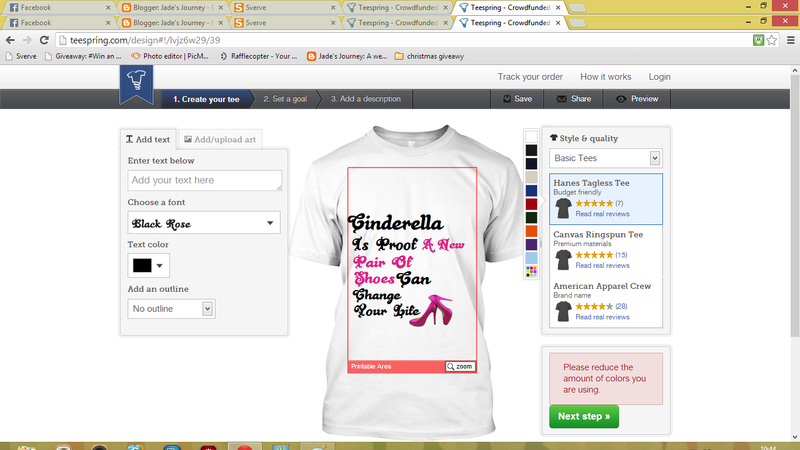 That is a little design I did just to show you how easy it is. On the right hand side you can choose the quality of the material of the T-shirt and in the drop down box you can choose the style like tank-top, hoody etc. The colour strip is where you choose the colour of the T-shirt. After you have perfected your design you move onto the next step, this is where you set your goal where you select how many needs to be purchased before they are printed. It tells you the price for each t-shirt which you can change so say they set the price as 7.50 you could change it to 10.50. It also shows you what profit you will make from this. So the last section is giving information on why you are selling these t-shirts and how long for. I have had a little look at some of the reasons/campaigns on why they are selling their T-shirts and what the cause is for. This is simply fundraising the easiest way possible, you get your on link to your t-shirt on their site and you can post it everywhere. I have popped a few links so you can have a look at some of the ones people have done. Ahh that's quite a good idea!